Doosan Arena or Stadion města Plzně (Plzeň City Stadium) as it often still referred to as, is a multi-purpose sports venue located in the fourth most populous city in the Czech Republic, Plzeň. First opened in 1955, the 11,722 capacity stadium is primarily used for the football matches of FC Viktoria Plzeň. Viktoria Plzeň’s stadium first opened in 1955 when it was known as Stadion města Plzně or in English, Plzeň City Stadium. Famous for its two story grandstand which was regarded as the pride of the ground, the stadium peaked in the late 1990s with a capacity of 35,000 making it one of the largest in Czech Republic. 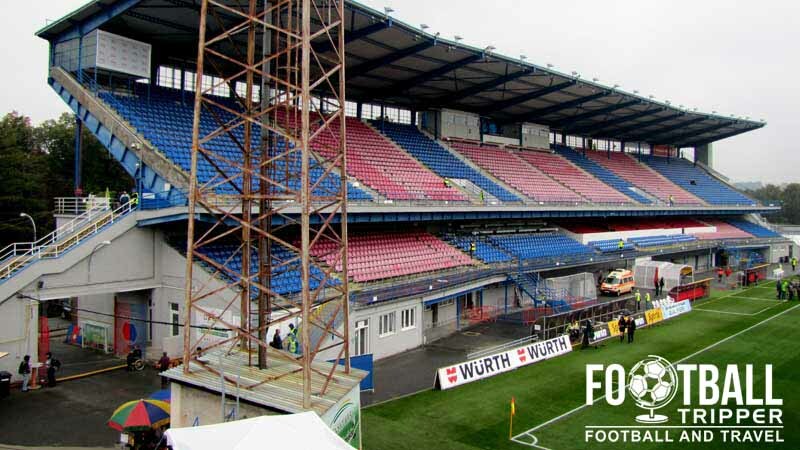 During the 2002/2003 season Plzeň City Stadium underwent renovation work to comply with the updated regulations set by the Czech Football Association. With a large proportion of the capacity made up from terrace places, the stadium’s capacity was significantly reduced during the conversion to all seater resulting in just 7,425 spaces. When FC Viktoria Plzeň qualified for the Europa League in 2010 after wining the Czech Cup, the club were forced to play their match against Besiktas at Prague’s Synot Tip Arena much to the disappointment of fans. Subsequently the following year the club engaged in an estimated 360 million Koruns worth of renovations in order to satisfy UEFA’s stadium criteria. 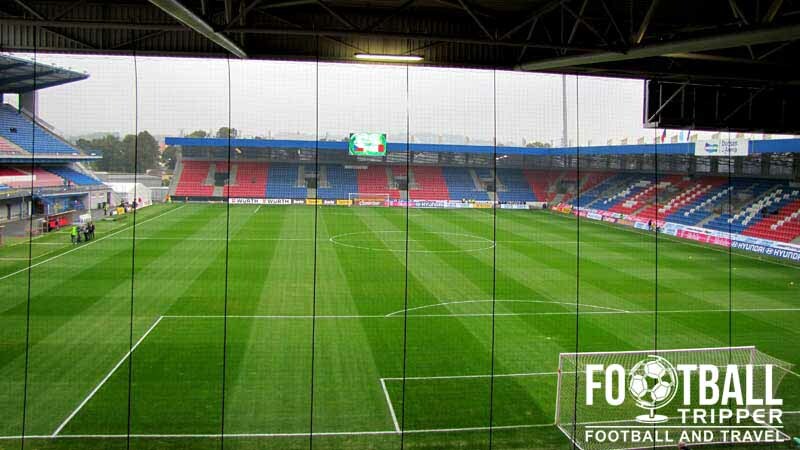 Occurring across an eight month period between April and December 2011, Viktoria Plzeň’s stadium had a capacity of 8,500 at the start of the season, and a completed 11,700 capacity at the end of the year. Upon reopening the stadium was officially renamed the Doosan Arena. The first European match was held on the 16th February 2012 against Schalke 04 in a qualification match of the Europa League. The following season the Doosan Arena hosted its first ever Champions League match when Viktoria Plzeň reached the group stages. Fans of the club rejoiced as Doosan Arena hosted European giants Bayern Munich, Manchester City and CSKA Moscow. The Doosan Arena is comprised of four stands: North, East, South and West. Viktoria Plzeň are known for their passionate fanbase with league matches regularly averaging attendances over 10,000 in recent seasons. Often voted as “the best fans” in the Czech League, Champions League and Europa League matches are almost always guaranteed to be sold out, and for the club’s supporters, taking on Europe’s most famous team’s are often the highlight of the season. When it comes to European matches, the visiting team are usually allocated just under 600 tickets, with FC Schalke 04 being the first away team to play at the newly renovated stadium back in February 2012. Away fans are housed within a clearly labelled section within the far side of the main stand known as “Hlavní Tribuna”. As the birthplace of Pilsener Beer you’re spoilt for choice when it comes to great-tasting locally produced lager and ales. 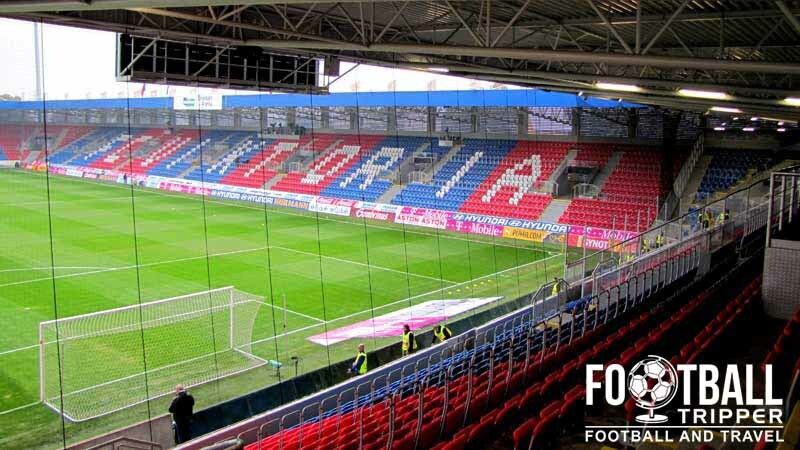 FC Viktoria Plzeň operate a club-shop at Doosan Arena within the main stand, in addition to an official online store. Matchdays: 6 hours before kick-off and 1 hour after the full time whistle. For more information feel free to send an email to [email protected] or phone the store on + 420 734 878 230. It doesn’t appear as if Viktoria Plzeň currently offer tours of The Doosan Arena, however if this ever changes, we’ll be sure to update this section. Viktoria Plzen fans inside the Doosan Arena on a matchday. 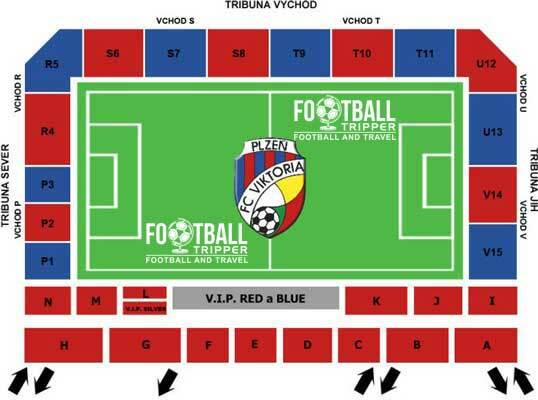 Tickets to see FC Viktoria Plzeň play at home during Czech First League matches can be purchased around the stadium before kick-off. Whilst this still remains as the most popular method of acquiring tickets, since 2008/2009 fans can now purchase tickets online and from locations resellers around the city. 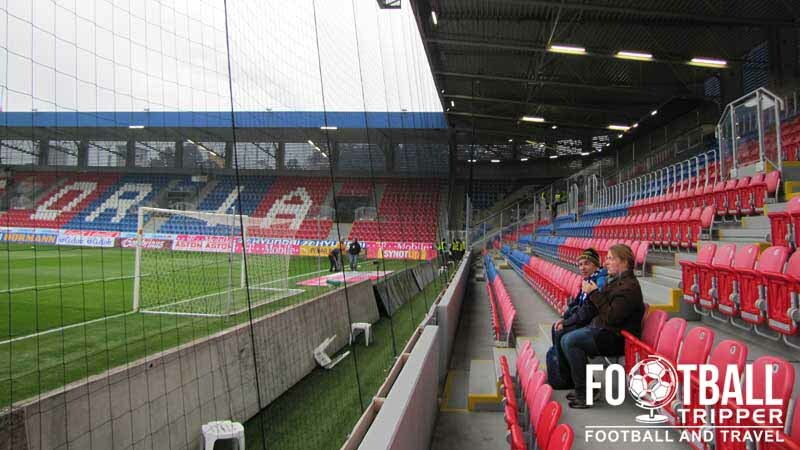 Whilst we don’t have direct access to ticket prices, in seasons gone by fans would pay anywhere between 150.00 – 200.00 Czech Republic Koruna for seats within the stadium. Converted into euros this is works out at around €5.00 – €10.00. Champions League and European matches are naturally going to be more expensive however. The main railway station of Pilsen is known as “Plzeň hlavní nádraží” is located 800m to 1.0 km south of from Doosan Arena, with the journey by foot likely to take no more than 15 minutes. Due to the compact nature of the Plzen city centre there shouldn’t be a much need for a bus, however there is a bus stop at “Na Rychtářce” along the main road west of the stadium which is served by Bus 28. As Viktoria Plzeň’s website doesn’t offer any guidance regarding parking it’s hard to say where the best option is. A safe option would probably be to try the car-park near to the Plzeň hlavní nádraží railway station, however it will likely cost you a few CZK. Doosan Arena has one of the most visually pleasing appearances since the renovation work. There is an airport located 11km south-west of Plzeň within the village of Líně, however it only accommodates private aviation enthusiasts, and domestic flight routes. Subsequently the official tourist website of Pilsen recommends flying into Václav Havel Airport in Prague, and then making the 50 minute journey by car. There are a good number of hotels within a 1.5 mile radius of the railway station with the likes of Angelo Hotel Pilsen, and Hotel Astory right outside the terminal. Just across the river, west of Doosan Arena there is more choice with the likes of Hotel Rango, Rous and Hotel U Zvonu offering reasonable prices.